After four films that played with imagery and plotting, Gus Van Sant returns to more narrative storytelling for a biopic about the political career of Harvey Milk, who was killed in 1978 by a disgruntled former fellow politician. The film features a beautifully transparent performance by Sean Penn as Milk. But Penn didn't accompany Van Sant on the global press jaunt with writer Dustin Lance Black and costar James Franco. Lance: It was in 1990 and my stepdad had just moved us out to San Francisco from San Antonio, Texas, as part of the military. We were a devout Mormon family, so it was very conservative. I knew that I was a gay kid very early on, but you don't come out. There's not such a thing in San Antonio - definitely not in the Mormon church or the military. When I got to San Francisco I got into the theatre and I was really lucky that there was this theatre director who told me the story of an out gay man. And I thought, "That's insane. Why would someone willingly do that?" I thought the guy must be nuts. And he said, "No, this guy was actually beloved by this city and was elected to public office." And you could just tell by the way he told the story that he had a lot of pride in it - and this was well over a decade after the assassination. The story itself was very hopeful, and the way this guy talked about it - clearly he was sort of coming out to me in that moment too. And I think it was the first time I knew that I didn't have to be completely ashamed of who I was, and that there was a future, that you could potentially live truthfully. Those were new ideas for me, so it was a really transformative moment. You know, closeting for adolescent kids is really dangerous - it shuts you down emotionally and stops you from developing in a normal way. And I think that was the moment that freed me and allowed me to start growing again. Gus: And I was involved in the earlier film project. I heard about Oliver Stone doing it in 1991 - he was about to shoot a story about Harvey Milk starring Robin Williams, and he decided right after JFK not to for some reason. He said it was because he didn't want to do another assassination movie. I took over for about a year as a replacement - and I got to know some of the characters who were in the story, mostly Cleve Jones, who later introduced me to Lance. So I was part of it in 1992 for about a year and then it was handed over and had another life with about six or seven other directors attached through the years. And then I met Lance in 2007. Reading his script I thought that he had really narrowed in on a part of his life that enabled it to be a feature film. In the other tries it was just trying to take on too many subjects and too many episodes of his life. James: I grew up in Palo Alto, which is about 45 minutes away from San Francisco, and I was born in 1978, the year Harvey Milk was assassinated. When I heard about the movie I wrote Gus and said I was interested. I didn't have a script, so I wanted to find out what the story was and I was shocked and sad that nobody had ever told me about Harvey Milk. It's kind of crazy that growing up right in the Bay Area I wouldn't know anything about him! 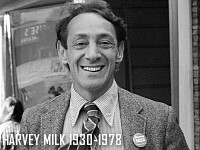 And there's the Oscar-winning 1984 documentary The Times of Harvey Milk by Rob Epstein, and I guess maybe that's how some of the younger generations learned about him, but I'd never seen it. I just thought it was an incredible story and an incredibly important story. How did you research the character? James: Scott Smith passed away in the mid-90s. I guess Gus, you met him. James: So I wanted to get it right - Scott was not really a public figure like Harvey Milk. But I just felt like I wanted to honour his memory. It was hard to find material on him - he's in the documentary for like five seconds. So I really depended on his friends - Cleve Jones, Danny Nicoletta, Anne Kronenberg, Frank Robinson - and then finally the director of the documentary, Rob Epstein, dug up this old footage that hadn't made it into the film - I don't think anybody had seen it in 30 years. It was an interview with Scott from the time - and that was a goldmine, so I used all that. How did you get Sean Penn on board? Gus: Actually I had offered him the role in 1998. It was an effort on my part to jumpstart the Oliver Stone project. I felt that, independent of the production company that was working on it, if I just attached Tom Cruise as Dan White - he was here in England shooting Eyes Wide Shut - and then Sean Penn as Harvey - he was 10 years younger than Harvey at the time - I could go into the studio and say look, I have these two guys and they would want to do it. There was always the problem of the gay community aspect of the film, so they needed a reason to overcome that fear that they had of making a film that wasn't going to have a very big return moneywise. I had visited Sean and he had read the script - a different script - at that time. This time, after he read the script, we had a meeting with him; Lance and I went to his house. And it took me halfway through the meeting to remember that I had already gone through all this and had met him before. I somehow forgot! I think it was interesting to him, and it was an easy decision because it was irresistible. It's a very outspoken political figure, something Sean was doing at the time. And also the perceived difficulty of him playing a gay leader was a challenge. As an actor you probably want something hard - it's interesting if it's hard. As a filmmaker it's interesting to me when it's seemingly undoable. It's a challenge. Like the film's tagline - "Never blend in". Gus: Harvey was talking about being out: never try to blend in and be straight, just be yourself. As a filmmaker I think never blending in is about having something that sticks out, so that you go see it, like a circus attraction. I'm still learning about that myself. As the years go by it's not something I'm trying to put into the films, but I think without realising it the through-line is always about family. Almost every film has something to do with a group of people that are put together that aren't necessarily related, but they're are creating a family for whatever reason. Sometimes it's survival, sometimes it's to get something done. In this case I think it's political action. That's kind of a through-line, but it's not intentional. Harvey's message of tolerance has interesting echoes in the US election last November. Lance: I think it goes beyond tolerance. I think the message was acceptance and love. Tolerance is something you don't like but you sort of put up with. Harvey's message was, "Hey, we're your brothers, we're your sisters, we're your family and we should be accepted and loved and included in all of the same rights your fellow citizens enjoy." I think it became painfully apparent on November 4th in California that we weren't quite there yet, and that there's still a lot of work to be done to introduce the gay and lesbian community to the other communities that are also fighting for their rights and their fair shake. And to say, "Hey, we're the ones who are hurt by this. This is who we really are, which is maybe not what you've heard from perhaps your pastor or myths and fears that have been passed down through the generations. This is who we really are, and we demand to be treated equally." And like Harvey Milk said, once you get to know us you realise that those things you've heard aren't true. Gay and lesbian people are not out to hurt your children or destroy your family. Those are just myths and fears. So I think in that way, we need this story again right now. Harvey's message was always about the kids. Lance: That's what it's always been about. I don't know how it is here, but I know that in the United States there are places where you have two choices: you either hide or you take a more extreme option and you check out, you take your own life. And I'm sure that still happens here. But it doesn't take much - it literally just takes an example to say that there's a way out that's uplifting and beautiful and empowering. A lot of people don't have access to that sort of history, so when I hear that we get Bafta recognition, some kid's reading that and asking, "Who's Harvey Milk?"